Now I like this one. It’s real simple, non-destructive and gets the point across. All you need to do is get a pad of sticky notes and write on each one……. …… “How’s that Hope & Change working out for you?” Every time you stop to fill your vehicle with gas, place your sticky note somewhere on the pump before you drive away. DO NOT be destructive in ANY way! 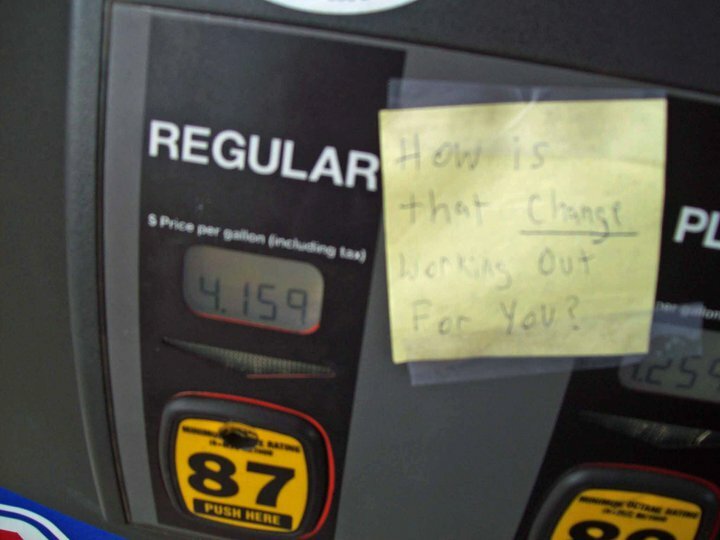 Place your sticky note somewhere, so as not to impede the next customer’s ability to read the pump’s digital readout. You can go to their Facebook page here to read more about it and see suggestions on where else to place the sticky notes. The hashtag on Twitter is #stickynote if you want to tweet about it.